Summertime is coming to a close, and Fall will be here soon. It will be a nice break from the Florida heat - hooray for the rest of the year and its lovely weather! We don't get a lot of Fall color here, so here's an image I took one October in France. It's from an outbuilding at Chateau de Chenonceau, in the Loire valley. 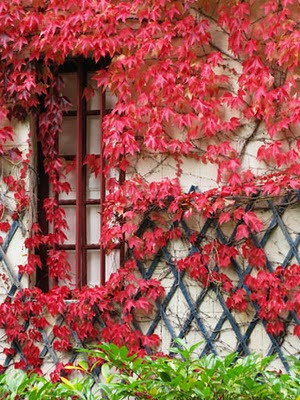 I love the rich red hues of the leaves on the vines. They are so lovely against the old walls of the building. If you like this image, you can purchase it as prints or greeting cards. Just click the image or the link below it for more info and to order at FineArtAmerica. Buy my artwork at FineArtAmerica.